We have available a selection of quality Gland Packings in convenient. One Metre Handy-Paks. These packings are available in sizes of 3.2mm, 4.7mm, 8mm, 9.5mm and 12.5mm. ​A general purpose white synthetic, PTFE lubricated packing, suitable for shaft speeds up to 12 m/s, 1500 psi, 230 degC and 2- 12 pH. Higher performance synthetic fibre graphite lubricated packing suitable for shaft speeds up to 13 m/s, 1800 psi, 315 degC and 3 - 11 pH. 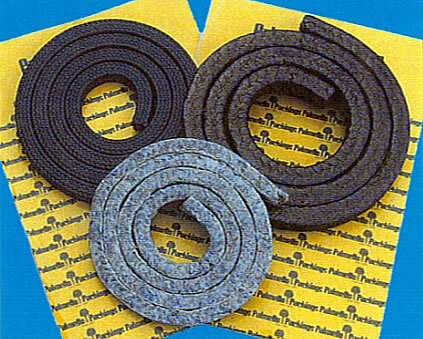 The Marine service packing, a PTFE lubricated flax packing, suitable for all seawater or brine applications. Shaft speed to 12 m/s, 400 psi, 104 degC and 6 - 9 pH. ​Abrasion resistant, Ramie fibre impregnated with PTFE lubricant for sugar, pulp and paper applications. Suitable for shaft speeds up to 10 m/s, 725 psi, -50 to 140 degC and 2 - 12 pH.